You are indeed very lucky to get Sai's blessings .He has come to your place to bless you and your family. You can give the prasad to anyone and if you happen to meet this postman or the courier man again you can offer the same. Sai will definitely accept anything which is done with pure love and devotion. All he expects His devotees to have faith and patience. So nothing to worry. Good to read your post on this auspicious day. Thanks. i did this pooja and completed succesfully..
in the middle of pooja,he asked me whether he can take some candy..i jus cdnt ignore coz he was a kid..
after tat nearly for 15 days he sat next to me, helped me in pooja and also eats some candy's kept to baba..
Sai bless you both abundantly. Kindy distribute the prasad to anyone in the temple or any of your friends. With reagrd to kid having the sugar candy, Baba never deprived or encouraged fast to His devotees. Sai comes in any form or He will send someone in anyway and makes His devotees happy. I am sorry for the late reply. I just noticed these mails. 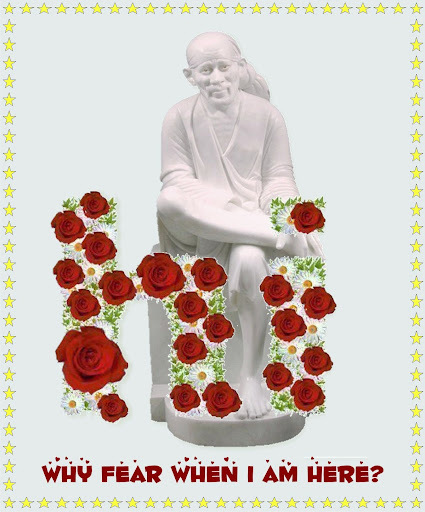 Sai guide you both and fulfills ll your wish and prayers. i did this pooja with all faith and collected the sugar candy. once forty days was completed i was thinking how sai baba will take the sugar candy from us. That day 1 weird thing happened. 1 monkey entered our house. It managed to enter the grill gate in the balcony and entered the kitchen . it took the sugar box kept in the shelf and went away. The surprise is it didnt take anything else. It also didnt disturb any cooked items. My husband ran to the terrace and he saw that the monkey opened the sugar box and ate the sugar greediliy. My husband went near that, the monkey threatened him and took the sugar box and went. We dont know were from a monkey came in such a place like k k nagar in chennai . Really we were unable to control the laughter for some days. Then suddenly i was thinking that sai baba didnt come for the sugar candy. My mother told me not to worry as baba has accepted the sugar instead of sugar candy. Then we bought ghee, rice and took the sugar candy and gave it to mylapore temple so that they can make kalkandu chakarai pongal. This was the experience i faced. I still didn't start the 40 days Pooja. Planning to start from 1st Jan 2011. My question is, if Sai Baba comes within the 40 days and takes the sugar candy, should I continue the pooja. If "YES", should I keep collecting the sugar candy after that also and what should I do with it. Yes, Sugar candy means Kalkandu. Dont have too much of doubts and think whether baba will come or not. Just start offering and have enormous faith in him. That will help you . Page created in 0.383 seconds with 54 queries.